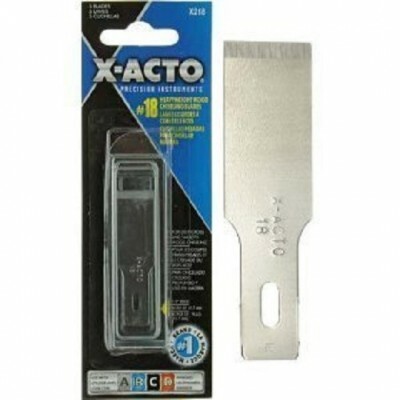 X-ACTO X218 5pc No 18 Heavyweight Chiseling Knife Blades. For deep cross and smooth wood chiseling. Balsa, wood, linoleum, and bass wood. 1/2 inch edge. Fits 3/8 inch X-ACTO No 2,5 & 6, Type B,C, and Type D handles, as well as Excel K2, K5, K6, and K7 Handles. Carbon steel blade for a reliable cut every time Attaining this level of precision, accuracy and reliability starts with supreme quality craftsmanship The original X-ACTO knife/blade has been praised for more than 50 years as the standard for precision.